The first three Roasters are ready to hit the battlefield! World football star Mark “Fiiiish” Fish, shooting-from-the-hip Nina Hastie with her outspoken comedic talent, and the baddest rock star Francois Van Coke will take on the notorious Rapster with an epic shoot-out in the highly anticipated Comedy Central Roast of AKA in partnership with Showmax, coming to The Teatro at Montecasino on 21 February 2019. There ain’t nothing “fishy” about this Roast panellist – after making a real “Twit” of himself by accidentally announcing the passing of very much alive Sipho “Hotstix” Mabuse, Mark is nonetheless “The Big Fish” who knows better than anyone else how to defend without “taking the bait” and can attack with equal skill. A major part of our win in the 1996 African Cup of Nations, Mark quickly went from sardine to barracuda in the South African and international football scene, playing for several European clubs. Father of four and local heart-throb, he has a boot of solid steel and women just love his heavenly ball play. Roastee AKA and the panel had best not rub this “Fiiiish” up the wrong way! Teaming up with Mark for the burn of the year is the courageous Nina Hastie who has no filter when it comes to speaking her fiery mind. This pint-size pack of dynamite is no stranger when it comes to beating the odds. She knows how to talk “big” and is sure to show her grit with her knack for the attack. “I’d love to see his mom Lynne Forbes on the panel, I doubt there’s anyone who knows him better. I would roast him on skipping leg day the most. His whole leg is ankle. Maybe that’s why he got a shoe sponsorship… Because having a whole leg as an ankle makes a shoe look very special,” said Nina. In a perfect yin-and-yang, rock versus Rap face-off, the legendary bad boy (born BADenhorst) Francois van Coke will take centre stage and drop the mic to try to face off AKA. Having already told the polisie what to do with their polisiekar this local rock idol will have no skaam when he gets into the ring with the boss of Rap. After breaking records with “Toe Vind Ek Jou” will Francois bring enough rock to the stage? Is he the bloke to get AKA to choke? 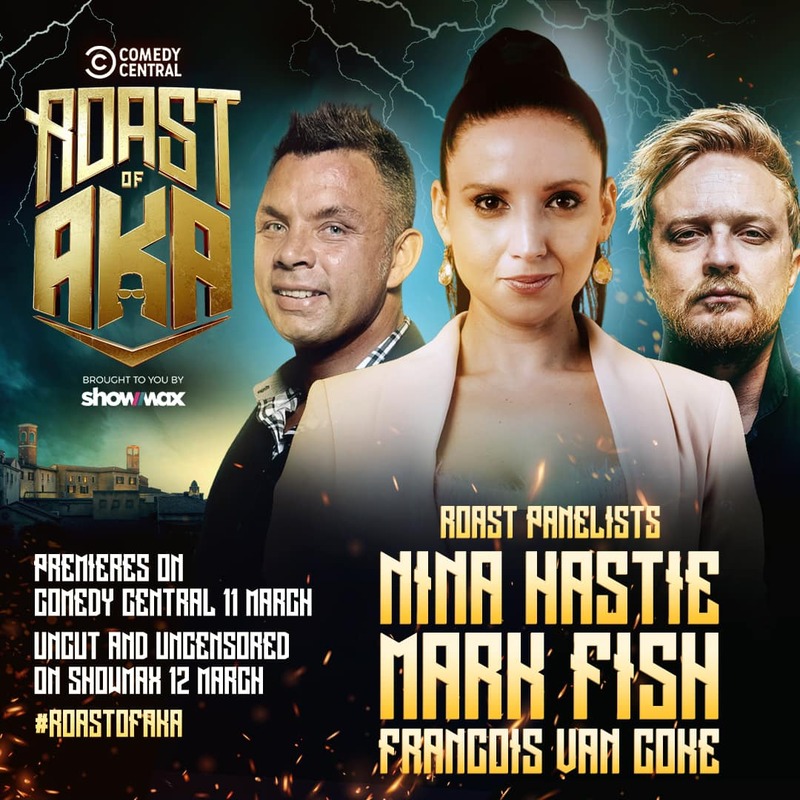 Hilarious, thought-provoking and without reservations, the Comedy Central Roast of AKA in partnership with Showmax is the perfect grill for an audience who enjoys a spicy banter. The Roast comes to Comedy Central on DStv on 11 March 2019. The uncut, uncensored Comedy Central Roast of AKA arrives on Showmax the very next day, on 12 March 2019, and everyone can watch it. Here’s how. New to Showmax? Sign up for a 14-day free trial at www.showmax.com today. DStv Premium subscriber? Add Showmax to your bill and get the uncut, uncensored Roast at no extra cost. Go to www.showmax.com/dstv. DStv Compact or Compact Plus subscriber? Add Showmax to your bill before 31 March 2019 to get Showmax free for two months, including the uncut, uncensored Roast from 12 March 2019. Go to www.showmax.com/dstv to find out more.